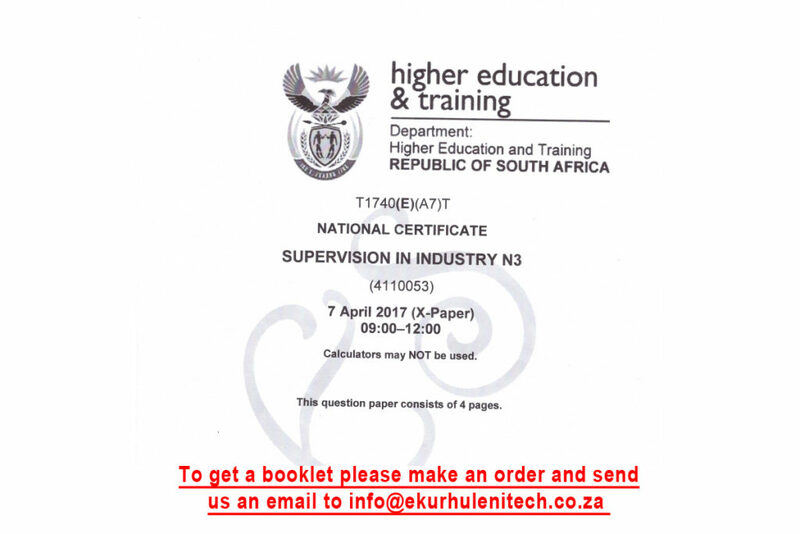 Supervision in Industry N3 question papers are a great way to practice with as you are preparing yourself for your exams. Supervision in Industry Past Exam papers gives you an opportunity to know the examiner’ mind and what to expect in the exam. Most of the Supervision in Industry exams follow a particular pattern and after practicing with different question papers you will be more than confident and ready to face your own exam. So how do you get hold of the Supervision in Industry Past Question papers? You can purchase these from our college at a very reasonable price which does not include courier (shipping). We have the booklet that is comprised of question papers and memorandum (answers) for different exams. To get hold of the book you need to send us an email on info@ekurhulenitech.co.za and we will gladly help you. Or alternatively you can call us on 011 040 7343. The price of the Supervision in Industry Past exam booklet is R400. Please note that the booklet is a collection of exam that we compiled since long back and the quality of these is not fully like a new book but are scans from original papers. Also note that the papers are also from old papers as we have experienced with the Department of Education that they like bringing similar papers to those of old. So when making a decision to buy the Supervision in Industry past exam papers booklet keep that in mind. What is of main importance is that the information is clear and can be read easily. If you want pure quality on these please do not make the order as we do no refund once the order has been made and paid for.